labs: Maya Recover | andrewANDORU. . .
Maya is great, it can handle all of them CG’s that are so popular now a’days. What isn’t so great is that due to it’s fancy pants nature, it can crash at very inopportune times leaving you with your hopes crushed and tears streaming down your face. 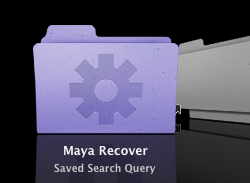 . .
Luckily, Maya does store recovery .ma files on every operating system that it is available for, on the Mac they are stored in a hidden folder (/private/var/folders/), and in those hidden folders are folders that a normal human doesn’t really understand. However, it is very easy to set up a search that will indeed search these hidden folders for .MA files, allowing you to easily find your latest recovery data. Just unzip the file, and place it in a easy to find directory (I recommend the default Maya directory in your User/Documents/maya folder, so it is always easy to find). 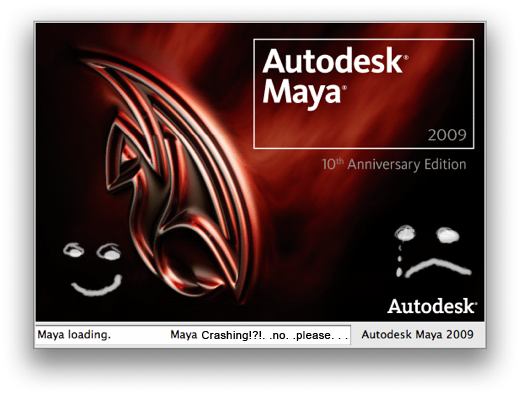 I don’t care how cool you are, if you have used a 3D app, it has crashed on you before, and you have shed a tear. If you try this out leave me a comment. UPDATE: This will-not always work 100%, sometimes it can miss some temp files, because it doesn’t always search the entire nested directories, so if you aren’t seeing it, another method is to go to a Finder window press Cmd+Shift+G, and type /private/var/folders/ and press return. In that “folders” folder is a bunch of arbitrarily named folders, in one of those there should be a -Tmp- folder that will likely have some .ma recent recovery files. Hey there, came by from Tim Maughan’s site. For me Maya has been extremely stable on PC, but in my previous job Lightwave has crashed on me umpteen times as its quite a pain, really. Yeah Maya is very very stable for me in general, but having lost many hours of work in the past due to a crash, this is a great option to make it less painful. And with 3d apps in general, by nature they can do things that will cause them to crash. It is user error usually, not the app itself. You just saved my life. Seriously. THANKYOU! Thank you so much….. You save my life too…. Cheers…! Ahh! Thank you! I just had a crash and was freaking out until I found this, which found my recovery file. Thanks so much! No worries! Glad people are finding it and finding it useful. Hi, this is a comemnt.To delete a comemnt, just log in and view the post's comemnts. There you will have the option to edit or delete them. This totally worked! Thanks buddy! Whoo! I think I may put together a nice long post on some new Maya discoveries. One major one for me being RenderMan (not really a discovery, just at last a proper chance to use it). Thank you! Just saved me a night of work! Wahoo! Anyone know where to find this on a PC? Saved my arse. thanks again! owe you one. No worries. I am just curious. Were you actually able to use the SmartSearch or was it the information that helped out? Haha. you made it sooooo easy, thank you! About to get dramatically easier! Check out the site in the next few days. Thank you so much! I really wish I had come across this last year. This is amazingly helpful. I hadn’t had a Maya crash in awhile and got cocky… Thank you!